I’m usually not a big Christian Romance fan as they’re often tepid. That said, Give the Lady a Ride is not tepid. I found it to be a page turner and enjoyed it immensely. The four main characters, and all the supporting cast members, are extremely likeable. Take two New York City socialites, have one inherit a Texas cattle ranch complete with handsome Christian cowboys, and you’ve got a mix that is bound to intrigue. 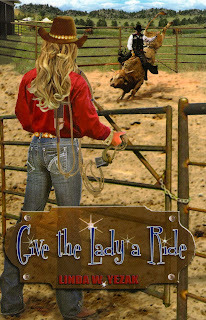 The women are attracted to the cowboys and vice versa, but their lives are totally different. Add that the new owner wants to sell the ranch, and…well, you can imagine a conflict of one sort or another is going to result. Patricia and Marie find faith, love and excitement galore in this fun novel, not to mention the ins and outs of bull riding. Talon and Chance provide the ladies with the promise of a future neither ever dreamed of. Linda Yezak has woven her knowledge of cattle ranching into an exciting tale. When we read, we benefit from learning something, and this novel is filled with interesting facts about cattle ranching and rodeos — an enjoyable ride if there ever was one!